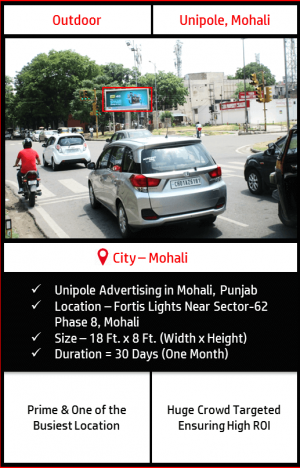 Unipole Outdoor Advertising at Fortis lights Near Sector-62 Phase 8 Mohali, Punjab – One of the most busiest location. Unipole sized 18 Ft. x 8 Ft. (W x H) at a prime location with 30 days campaign duration. Printing & Installation absolutely free one time with the package. Huge crowd targeted, hence highly recommended package by BMK. Outdoor Advertising helps your brand target the huge masses through its various forms like Unipole, Billboards, Hoardings, Posters, Wall Wraps etc. A form of static branding which gives your brand an ultimate mileage 24×7. A medium which is quite flexible & promotes the brand message in different ways at different locations. Quite flexible in terms of duration of the campaign (Recommended for small campaigns as well). No time limit. Brand message is conveyed properly through this medium since interested target audience can take as much time to understand the communication effectively. Huge Brand Recall ensures Great ROI. 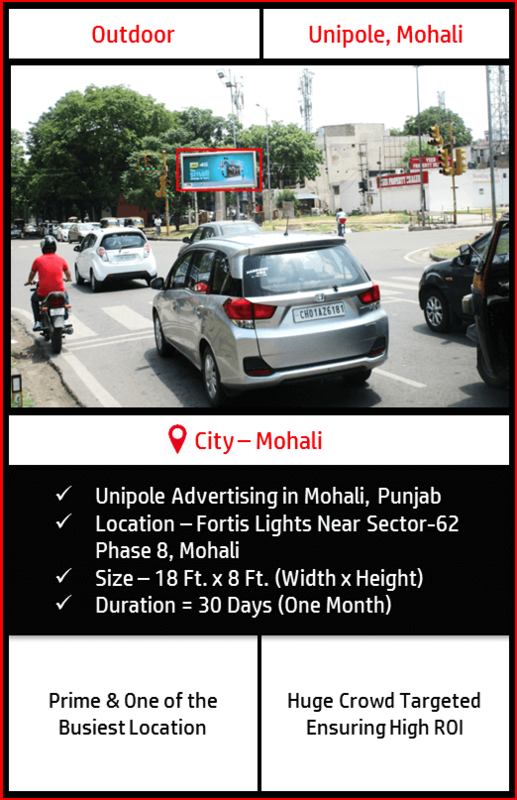 A Grand Reach to the population of Chandigarh, Panchkula and Mohali. One of the most prime and busiest location of Chandigarh Tri-city. Strategic location ensures minimal ad avoidance. Dimensions (Width x Height) 18 Ft. (W) x 8 Ft. (H) = 144 Sq. Ft.
Campaign once booked can’t be stopped in between. BMK needs to be intimated 7 days in advance if creative needs to be changed. In the case of the damage of the creative due to unavoidable circumstances, the same would be intimated to client within 48 Hrs.